I WROTE A BOOK! aND YOU CAN ORDER IT HERE! It’s called “Awake and Aligned: How to Navigate the Human Experience as a Spiritual Being” and the information that came through for it is so timely. I’m guessing you’ve noticed that there are a heckuva lot more “awake” individuals on this planet right now than there ever have been before, yourself included if you’re visiting my site. And you may have noticed, like I did, that awake doesn’t necessarily mean aligned. In other words, when people wake up and start moving about their conscious spiritual path, it can be as confusing as it is exhilarating, even feeling like a roller coaster ride you sometimes want to get off of because there seem to be so many twists and turns that it’s hard to enjoy or make sense of. I remember not that long ago where, after having been on my own awakened spiritual path for years, my frustration came to a head because it was like I had all these pieces of the spiritual puzzle and NO CLUE as to how to put them together. It was so hard to create any forward momentum, to consistently experience the magic of this Universe and myself as a powerful co-creator that I so deeply believed in. Does this sound familiar to you, too? Once I figured out the alignment piece and began consistently applying it, that’s when everything drastically changed and the magic became commonplace in the best possible way for me. From there I began mentoring and coaching other awake individuals to align with Who They Really Are so that they began creating the magic, too, which led me to putting it all in a book so everyone has access to it! 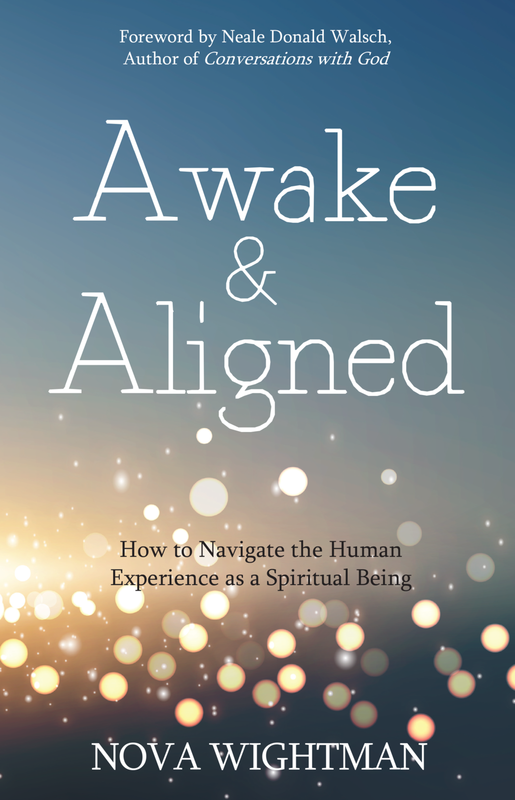 Awake and Aligned takes you on a powerful conscious journey of spiritual transformation, one where you will learn that this pesky thing called ‘being human’ is not only okay but is a vital component of living a happy, satisfying and fulfilling life. It shows you how to functionally merge your humanity with your spirituality and navigate your life from this awake and aligned place. The result? Well, how does being, doing and having everything you’ve ever wanted sound? I can say this all with confidence and conviction and not a shred of arrogance, because a) I am well aware that all, if not most, of the content came through me and didn’t originate with me – you just get my filter and experience, and b) I’ve experienced and witnessed the results of this work so many times now that it’s laughable to question or deny it. GUESS WHAT? I CREATED AN ONLINE COURSE TO GO WITH IT!! Get on my list to receive my newsletter and stay tuned for details on the online course I built specifically to accompany the book to be sure you get the most out it! This course will create some SERIOUS magic in your life - don’t miss out! Already have a copy of the book? Come grab more daily inspiration and find community and conversation in our Awake and Aligned Facebook Group!